Joe Stadstad, Sales Manager for Far From Normal, Gary Duncan, Owner of EmbroidMe Woodbury, Minn., Pam Duncan, Owner of EmbroidME Woodbury, Minn., Dylan Souza, Manager of Marketing & Communications for FDC Graphic, Films Inc., and EmbroidMe Woodbury, Minnesota team members. 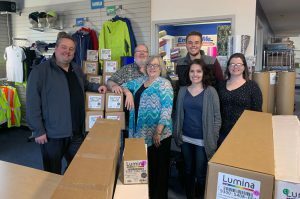 FDC Graphic Films, Inc. (FDC) has announced the winner of the $10,000 Great Lumina® Giveaway to Pam Duncan, Gary Duncan, and the team from EmbroidMe in Woodbury, Minnesota. His team entered at the DAX trade show in Treasure Island/Welch, Minnesota. Sign and graphics shops across the country were able to enter the giveaway online, and at numerous US national sign and graphic industry trade shows such as SGIA, ISA, DAX and more. FDC Graphic Films, Inc. provides converting services, warehousing, and expedited shipping delivered with FDC’s O.C.E. Guarantee: on-time, complete, and error-free. DreamScape Announces New High Performance Suede!